POLL: Did you watch the UT-Alabama game? KNOXVILLE — For the first time in 11 years the Third Saturday in October rivalry between Alabama and Tennessee pitted two ranked teams against each other. The 99th meeting between the two rivals produced one of the most lopsided games of the series. The top-ranked Crimson Tide flexed their muscle and flattened the ninth-ranked Volunteers 49-10 on Saturday at a sold-out Neyland Stadium. Alabama freshman quarterback Jalen Hurts ran for 132 yards and three touchdowns as the Tide (7-0, 4-0 SEC) rolled up more than 400 rushing yards against a shorthanded Tennessee defense. Meanwhile a Tennessee offense coming off a 684-yard performance at Texas A&M last week couldn't muster more than 200 yards against Alabama, which scored a pair of non-offensive touchdowns. It was Tennessee's most lopsided defeat since losing 59-14 at Oregon in 2013, and Alabama flirted with matching its biggest win in the series, a 51-0 blowout in 1906. Alabama gashed Tennessee's patchwork defense on its second series, when Damien Harris ripped off two runs for 30 yards and Joshua Jacobs added two more for 20 yards. ArDarius Stewart gave the Tide a 7-0 lead by scoring untouched from 29 yards out on a reverse. With its offensive line being overwhelmed by Alabama's defensive front, Tennessee got nothing going on offense and handed the Tide seven points when an errant screen pass by Josh Dobbs was intercepted by Ronnie Harrison and returned 58 yards for a touchdown. It was Alabama's eighth defensive score in seven games this season and extend the Tide's streak of games with a non-offensive touchdown to nine. Tennessee turned an Alabama miscue into its only points of the first half as Derek Barnett drilled Jalen Hurts from his blindside and jarred the ball loose. 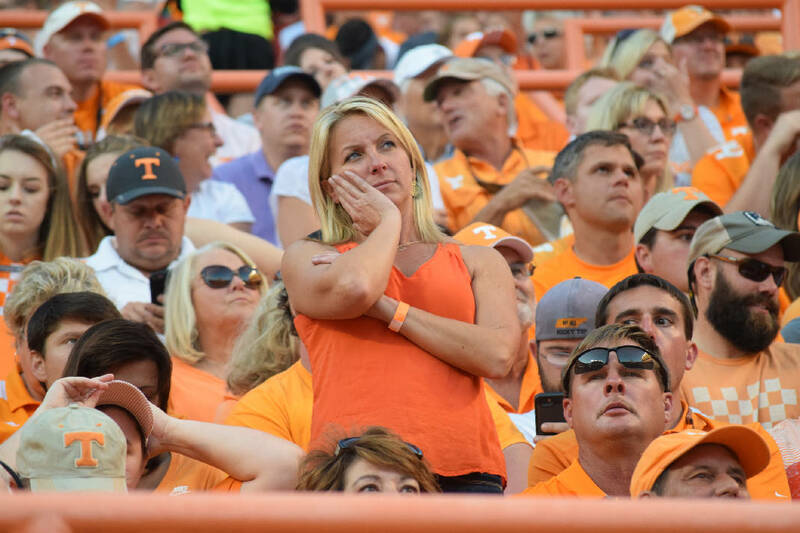 Quay Picou recovered at the 11-yard line, and Alvin Kamara scored from the 7 two plays later as the Vols pulled to within 14-7 with 10 minutes left in the second quarter. Alabama answered, though, as Stewart turned a swing pass into a conversion on third-and-8 and Hurts galloped 45 yards untouched to restore the Tide's two-touchdown advantage. Hurts ripped off another long run as Alabama reached the red zone, but Tennessee's Shy Tuttle tipped Hurts's pass from point-blank range and Barnett caught it for an interception. A 22-yard run by Jacobs gave Alabama another chance to add to the lead, but Adam Griffith missed a 38-yard field goal to end the first half. Hurts added a pair of touchdown runs in third quarter, and Alabama entered the fourth quarter with a 25-point lead as the Vols could muster only an Aaron Medley field goal in the third quarter. Eddie Jackson returned a punt 79 yards for another non-offensive touchdown early in the fourth quarter, and Bo Scarbrough added to the blowout with an 85-yard touchdown sprint to make it 49-10.